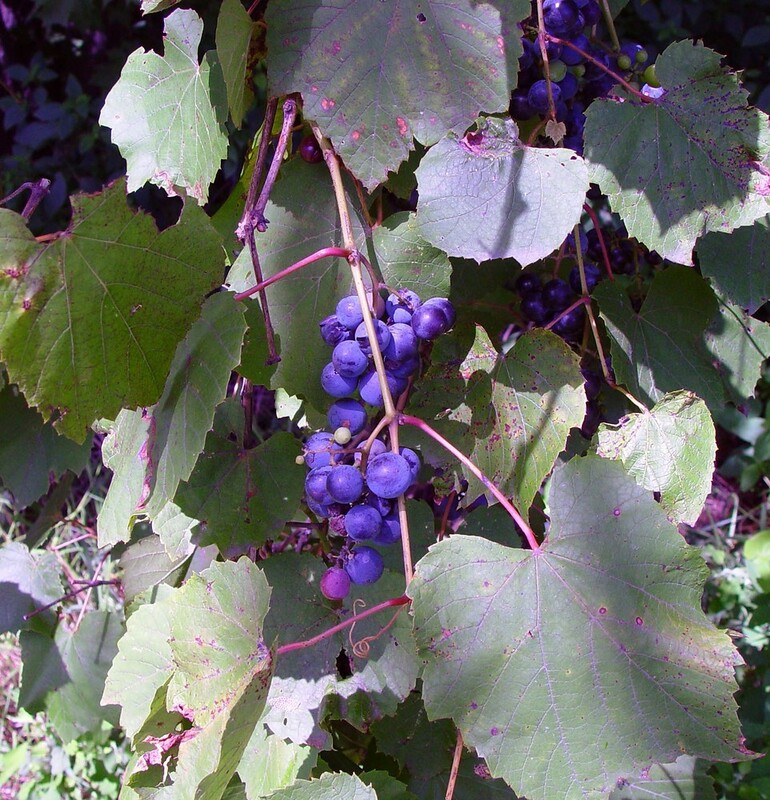 Vitis riparia. flowers.By Arthur Haines. Copyright © 2015.New England Wild Flower Society.gobotany.newenglandwild.org (Accessed 6/2015). Vitis riparia is a high climbing; bark brown, shreddy, pith solid at nodes, tendrils missing every third node. Leaves alternate, hairy (not wooly) only along veins or vein axils, blade round in outline, to 20 cm wide, deeply 3-lobed near tip, base round-lobed, green below, mostly hairless, margin toothed, teeth and lobe tips long-pointed. Flowers tiny, green, in elongate, unbranched clusters, 5-10 cm long; blooms May-June. Fruit black with waxy bloom, to 0.8-1.2 cm diameter; seeds about 0.5 cm long. Eaten and seeds dispersed by birds and mammals, including black bears, raccoons, coyotes, foxes, skunks and opossum (Wilson 1993). 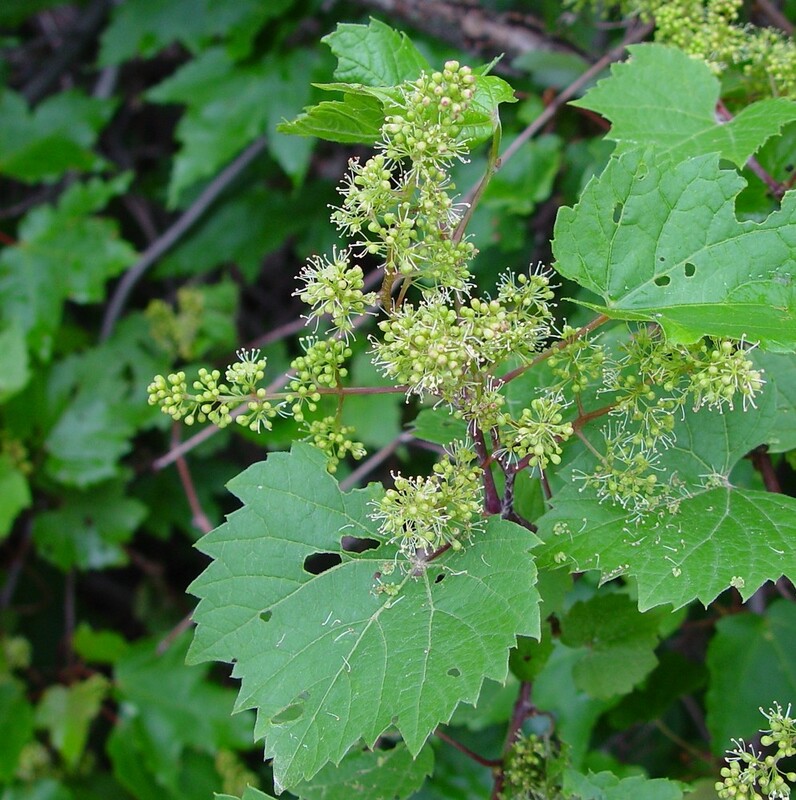 Vitis riparia. By Arthur Haines. Copyright © 2015.New England Wild Flower Society.gobotany.newenglandwild.org (Accessed 6/2015). Habitat: Moist forests, edges, soil pH 6.1-8.5; moderately shade tolerant, intolerant of fire, salt (USDA, NRCS 2010).